Have you been wanting to straighten your smile but don’t want to deal with a mouth full of metal braces? Did you know that you don’t have to wear braces to achieve a straighter smile? At Sharp Family Dentistry, we offer clear aligner orthodontics so you can discreetly align your teeth with nearly invisible aligners. Contact us to schedule your clear aligner consultation! Clear aligners use gentle force to push your teeth into their ideal positions over time. To begin your treatment, we’ll discuss your smile goals and decide if clear aligners are the right orthodontic option for you. If they are, we’ll design a treatment plan with our smile preview software and take impressions of your teeth. We’ll send your plan and your impressions to an off-site lab where they’ll create a series of aligners. You’ll wear each set for about two weeks and switch them out for the next set of trays until you’ve reached the end of your treatment plan. 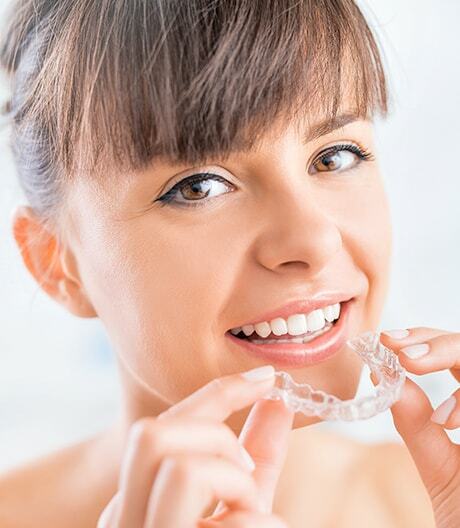 Compared to traditional metal braces, clear aligners offer a variety of benefits for patients. The aligners are made from smooth plastic that won’t irritate your cheeks & gums. Clear aligners can be removed to eat, drink, brush & floss. This orthodontic option generally requires fewer appointments than braces. On average, treatment time is shorter than traditional braces. If your teeth are crowded or crooked, clear aligners could be the perfect way for you to get a straighter smile. Aligners can be used by both teenagers and adults with mild to moderate alignment issues. The best way to find out if clear aligners are the best choice for you is to schedule a consultation with Dr. Sharp and our highly-trained team. We can examine your smile, go over your goals, discuss your budget, and help you determine if clear aligner orthodontics are right for you. Contact our office today!